How Would You Like to Get Control of Your Life? Stop Working Those 80 Hour Weeks. Get To Know Your Family Again. If so, then the book, 'Balance Your Life - The Complete Guide to Managing Work and Family', is definitely something you need! Jim owns a franchise tire and brake service store and he spends most of his time at work. He is afraid to leave his employees to manage things because it is his business and he wants things done right. But he finds himself working every weekend and his wife has gotten tired of spending evenings and Sundays alone. She wants to go out to dinner and a movie but, when Jim gets home, it is too late and he is too tired. Jim's mother is aging and his father passed away. He needs to spend more time with Mom. He wants to get some work done on your house and fix some things that are in disrepair, but he barely has time for the upkeep on his own house. What I can teach you is not difficult to learn. 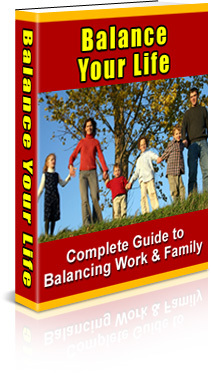 'Balance Your Life - The Complete Guide to Managing Work and Family' is a step-by-step guide that will teach you how to take control of your life.